Gonzales @ the Bloomsbury Ballroom, 08/04, originally uploaded by jellybeanz. 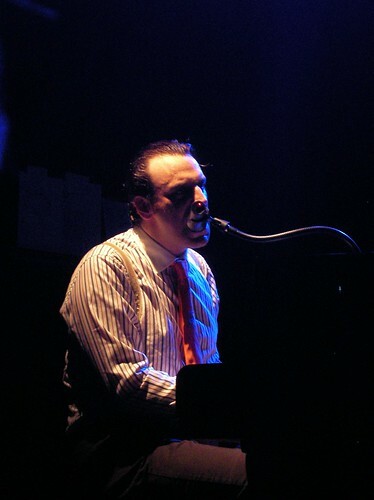 No one quite does a live show like Chilly Gonzales. While last time was all about the fun and entertainment, this time with only Mocky and not the full live set up it was a lot darker, with more ‘Angry’ Gonzales. Still no one quite entertains like Gonzales. It started with him putting on white gloves to give the air of formality of some classical performance and it ended with a short song performed by standing on the piano, playing with both feet, whilst wearing slippers. 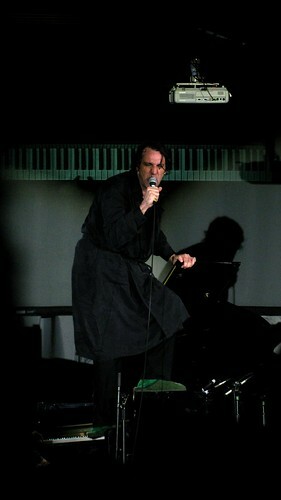 Whilst he gives off the air of a gentleman of leisure, performing in a dressing gown and slippers, the projector display showing the piano keyboard revealed his piano playing. Throughout the show Gonzales swings from being a serious performer and improviser to adding some strangely silly bits and overacting. Rather than watching a Gonzales show just for the music, it’s the whole package, you never quite know what he might do next. Gonzales, originally uploaded by jellybeanz. In the last 18 days, I’ve been to 10 shows. This seemingly culminated at my run of 4 shows last week, from members of Low performing in a tiny venue and the joyous experience of dancing at Soulwax. At the time I didn’t expect those shows to be surpassed. But then I had not seen Gonzales before. Since first listening to Gonzales (via his Breezeblock ‘remix’ in 2002 – which was a remix in the loosest of terms) I’ve struggled to explain what sort of performer he was. He isn’t quite a singer, though he has songs, and a rapper is a poor description of him too. And that’s not even considering his album of piano music released a few years ago. Whatever he tries, it just sounds like Gonzales, although in a completely different style. What he is, is an entertainer. Even including the Flaming Lips show from 2002, which is among my favourite shows ever, I’ve never been to a gig this much fun. Rather than watching a bunch of musician just playing songs, this show was more like a pantomime. At one point, his band even storms off stage ‘in protest’ about his treatment of them. Gonzales @ Paris Paris. Soft Power.